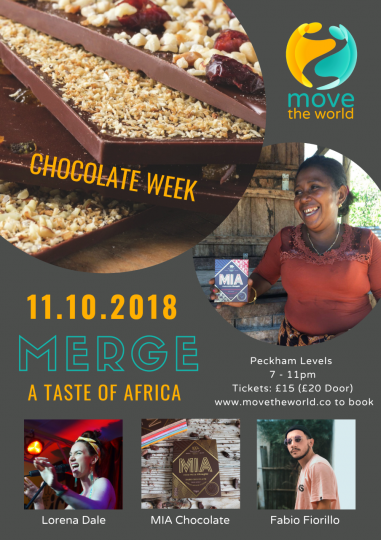 We’re delighted to be supporting Move the World, which is hosting their bi-annual fundraising event to kick off Chocolate week festivities: MERGE, A Taste of Africa. The event, which takes place at Peckham Levels on the 11th October from 7pm, is set to be the talk of London town with live music, dance performances, competitions and extra special MIA chocolate tasting sessions. If that wasn’t enough, for those searching love a unique Chocolate Speed Dating experience will be run on the night. Singletons can sign up to have the chance of eight different dates alongside eight different MIA chocolates. All proceeds raised on the night support Move the World’s locally led change projects in Medie, Ghana. Move the World is a UK-based charity focused on building the leadership skills and capabilities of local change-makers in Medie, Ghana. With experiential education at their core, they facilitate experiences that encourage people to step outside of their comfort zones and connect them with people from different experiences and backgrounds. Their work in Ghana is focused on youth-inspired community development projects. The collaborative team works with the community to inspire and support the development of projects that will impact the well-being of others around them. MERGE is a way for Move the World to engage their community in the UK with their work and to raise the funds needed to run training and projects in Ghana. They are currently fundraising for their Girls Empowerment Group and ‘Get Global’ education programme which will be piloted at Mayeh Preparatory School in January. The venue, Peckham Levels, aligns perfectly with the charity’s values of creativity and collaboration. It is a community space where Move the World and MIA’s friends can come together to celebrate the kick off of Chocolate Week.